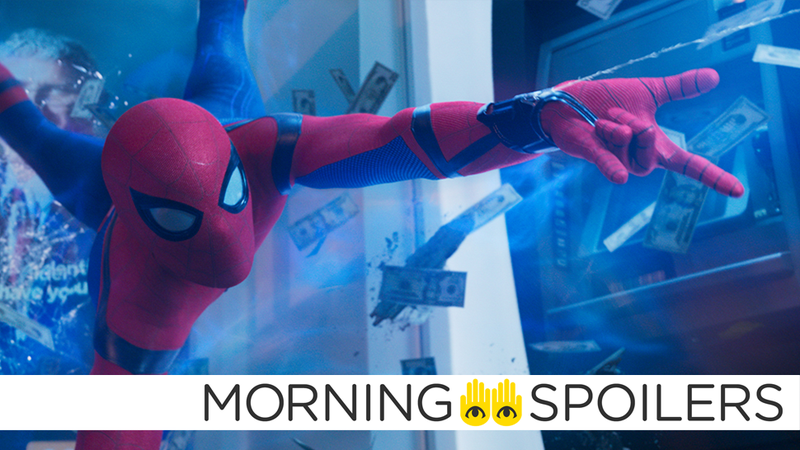 Peter could find himself up against a classic comic book foe in Far From Home. Doctor Sleep director Mike Flanagan teases connections to Stanley Kubrick’s classic take on The Shining. Another familiar face will return in Game of Thrones’ final season. Plus, a new clip from The Walking Dead’s return, Star Trek: Discovery might be hinting at an iconic Trek race’s arrival, and a new Hellboy poster. Spoilers, away! A pair of set photos from location filming in the Czech Republic seems to confirm previous reports that Jake Gyllenhaal is playing Mysterio, the illusionist villain from the comics who uses stage magic and hypnotism to befuddle his opponents. It’s a snazzy costume, that’s for sure. Variety reports Sam Claflin (The Hunger Games) has joined the cast in a currently undisclosed role. Maybe literally everyone but the angels in this movie are Bosely? In a new interview with Bloody Disgusting, director Mike Flanagan indicated the sequel to Stephen King’s The Shining will acknowledge Stanley Kubrick’s film. Yeah, I think you do. I think you do have to acknowledge that. There is no version of the world where I am trying not to acknowledge one of the greatest films ever made. There’s no upside in shying away from that reality. At the same time, this is not The Shining. It’s its own story and in a very specific way. If you’ve read the book, you know exactly why it’s so different but it’s quite a tightrope that we’re walking I think. I’m having a great time doing it. I’m just going to get the movie out and then turn off the internet for two weeks and see how it all goes. Bloody-Disgusting reports the Guillermo del Toro-produced horror film starring Keri Russell is now in production. According to The Wrap, Robert Downey, Jr.’s Doctor Dolittle film has been postponed to January 2020. David Harbour shows off his muttonchops on a new poster from Coming Soon. Peter Jackson and Hera Hilmar discuss Hester Shaw in a new featurette. Meanwhile, Hester stares down a lion-headed tank in a new poster from Coming Soon. Michael Myers knocks on the wrong side of the door in a new clip from Halloween. Eddie Brock tries transcendental meditation in the latest TV spot. Jon Snow’s direwolf Ghost will return in season eight according to visual effects supervisor Joe Bauer. A new poster from Entertainment Weekly confirms a January 2019 window for the second season’s premiere. Note the design at the heart of the delta—the shape is vaguely reminiscent of Discovery’s take on the Mirror Universe’s Terran Empire insignia, but the wing motif could also likely be a hint at the arrival of the Romulan Star Empire in Discovery’s story. Entertainment Weekly also has photos from the season two premiere of Future Man, coming January 11. More at the link. The first episode of Channel Zero’s latest season (premiering October 26) is now available to stream on Syfy’s website. Finally, Rick and company visit the Sanctuary in a new clip from the season nine premiere of The Walking Dead.